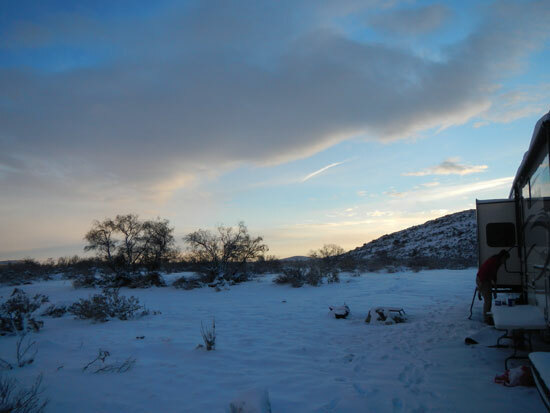 We decided to ring in the New Year by taking the RV off the grid and doing a little RV boondocking near Carlsbad Caverns National Park in New Mexico. We found a spot on some BLM (Bureau of Land Management) Land just a couple of miles outside of Carlsbad, NM, off of Dark Canyon Road. You can plug the following coordinates into your GPS to find the spot: 32.290279, -104.348104. To get there, coming from Carlsbad, head South on Highway 180 just a few miles past the entrance to the airport and take a right on Dark Canyon Road. From the entrance of Dark Canyon Road its about 4 miles and on the right, just past a right-hand turn onto Hidalgo Road. 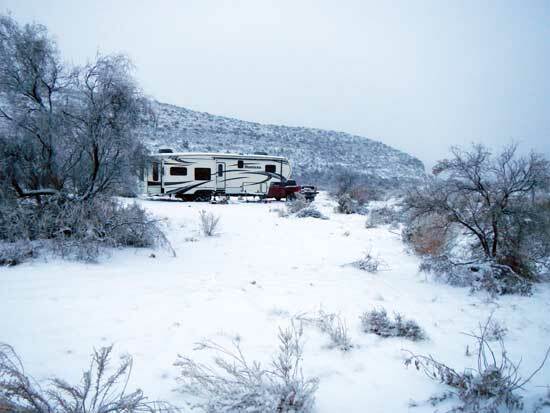 There are three entrances to the area that you can park your RV to camp. 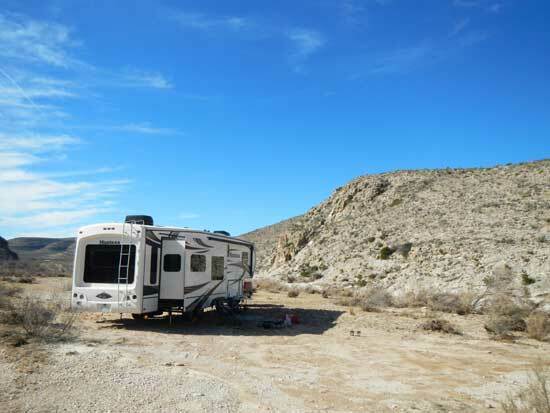 This RV boondocking site isn’t a destination by any means, but its free and just a short drive away from Carlsbad Caverns National Park and Guadalupe Mountains National Park. The sites are huge and easy to get into. We didn’t have any problems at all pulling our 40′ Keystone Montana into it, nor getting it out. Just watch out for thorn bushes. They can be murder on your tires. 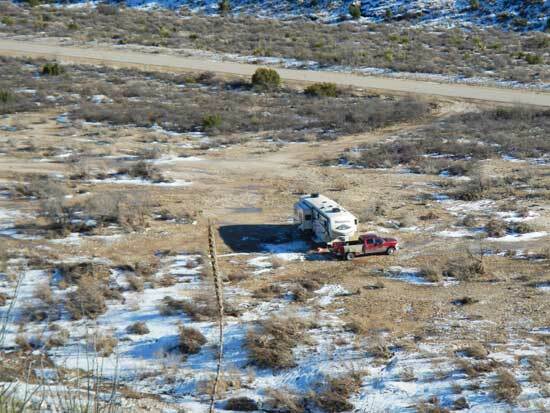 We recommend angling your RV as much as you can so that it isn’t parallel with the canyon walls. That will go a long way in cutting down on the wind, unless you want a strong breeze to cut down on the summer heat. Boondocking site from the canyon wall. You can see Dark Canyon Road and the second entrance to the sites in the background. One thing you really need to be careful of is to stay out during the rainy season. This area is very prone to flash flooding and it was very apparent when we were there (based on the pushed over brush) that the water can come well over the boondocking sites. You don’t want to end up watching your RV float down the river. There’s also a bit of oilfield traffic on the road nearby, but the brush blocks the headlights at night and muffles the sound somewhat, so its bearable. He told us the low was going to be about 32 during the week, with some light precipitation/snow flurries. He missed by about 25 degrees and six inches. When we arrived, the weather was nice, but a bit windy. We had no problems driving in or setting up. We spent some time gathering some large river stones to build a good fire ring with a high wind break toward the direction the wind was coming in. (Remember, if you’re going to use river rocks for a fire ring, you need to heat them up very slowly. they can have moisture in them that can cause the rocks to crack and pop if heated too quickly. So, take it easy on the lighter fluid. Don’t start your trip with rock fragments in your eyes.) There isn’t much for firewood laying around here due to it being the desert, so if you want to build a big campfire, you should probably bring your own, or buy some in Carlsbad. The next day, the temperature dropped like one of those river rocks off of the canyon wall. It went from a slightly chilly 55 degrees the first day to 16 degrees with a 4 degree wind chill the next. It also brought a heavy coating of ice and dropped a coating of snow on top of that for good measure. Nature decided we were going to spend our vacation at our RV boondocking site and not driving around exploring. Luckily we’re full-time RV’ers, so we were well stocked for the trip. I had also filled our propane just before we left and filled the truck up with diesel in Carlsbad just before we arrived. Our diesel and propane did end up running low, but Carlsbad was just a few miles away. Toward the end of the week we had one last heavy snowfall, then it started to clear off. You can barely see our fire ring for the snow. 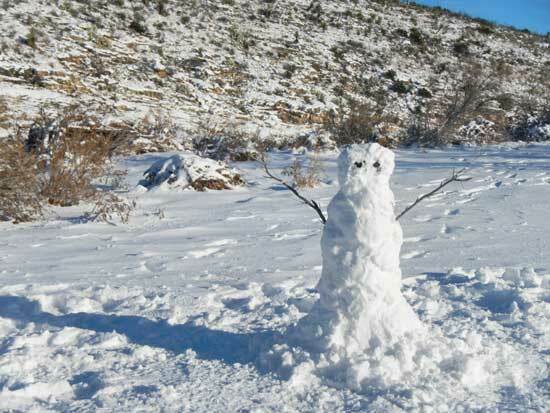 We built a noseless snowman to hang out with us. Since it continued to snow throughout most of the week, we ended up having to stay a couple of extra days waiting for the roads to clear enough to get the RV out. So, we spent most of our time trying to stay warm around the fire, cooking and enjoying some drinks. To save the propane for the heater, we tried not to use the stove for cooking. I ended up relying heavily on my campfire grate, dutch oven and coffee percolator for food and drinks. 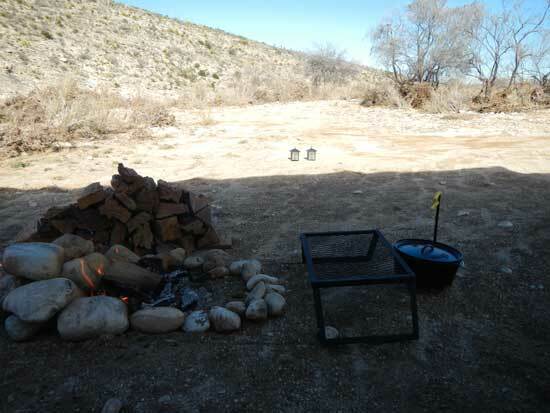 We had Mountain Man Breakfast out of the cast iron dutch oven for most breakfasts, which never gets old, and cooked campfire fajitas, steaks and other random stuff for dinners. 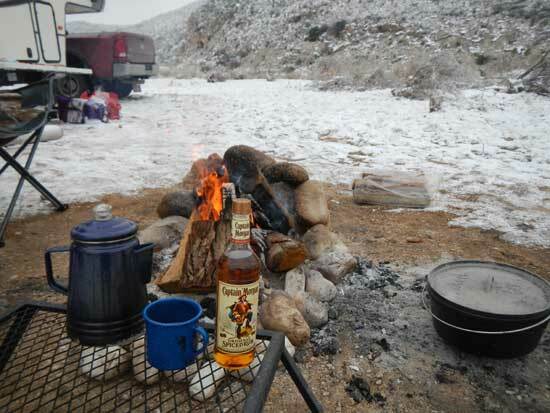 My favorite part was sitting around the campfire at night drinking excessive amounts of hot buttered rum. But, the trip would have been unbearable without our campfire coffee percolator . 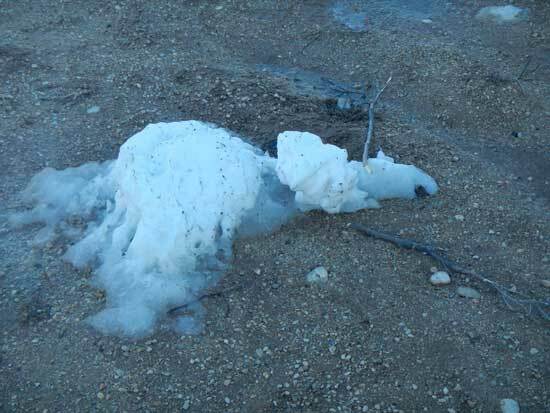 Once the snowman was face down in the dirt, we knew the roads were clearing up and our RV boondocking trip was coming to an end. Bring more supplies than you think you’ll need. Bring lots of extra drinking water (thank goodness we did) because the fresh water tank in your RV never holds up through the whole trip. You’ll need the extra for things like brushing your teeth, drinking (of course), and flushing the toilet. On trips in the winter, it would be handy to have a couple of spare propane tanks, full and ready to go. Rum can cause a serious hangover. High quality camp chairs make a big difference when you’re hanging around the fire for extended periods of time. 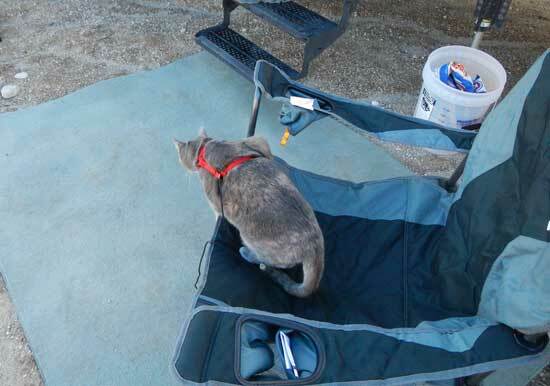 Cats don’t particularly like leashes or camping. UPDATE (3-6-2017): We got an email the other day from somebody that tried to stop at this spot. They let us know that somebody had come through and dumped large piles of gravel in the entrances to the sites, effectively closing them to entry. We don’t know if this is a temporary or permanent condition. Be sure to have a back up plan if you’re heading out there. Please let us know in the comments below if you’ve been out there and noticed the same conditions, or its opened back up. Area is closed permanently, heavy truck traffic from gravel pit.